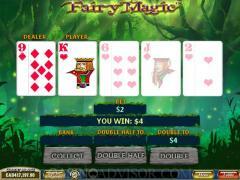 Fairy Magic from Playtech takes players to the enchanted world of fairies and leprechauns. 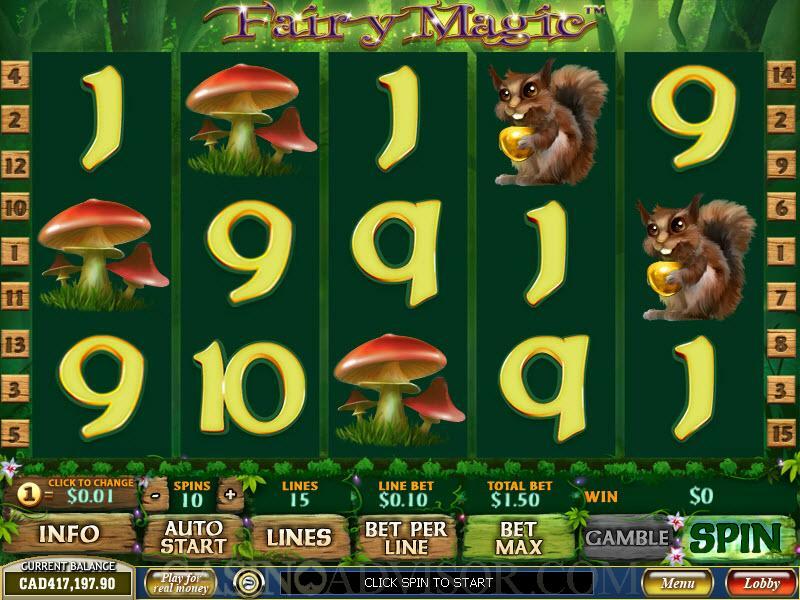 The slot game begins with an image of the fairy in her magical world from which the other symbols on the reels are taken. This image also highlights the Collective Bonus feature. The Unicorn is the wild symbol, the Tree House is the scatter symbol and the Fairy is the bonus symbol. The Leprechaun, the Flower, the Toadstool and the Squirrel are other symbols that enhance the theme. Symbols also include high value card symbols from Ace to Nine. These are crafted in an exquisite way that goes well with the theme. The players can choose from eight coin sizes ranging from 0.01 to 5.00. Most of these are between 0.01 and 1.00 making the game ideal for low rollers. For a given coin size players can choose from 10 line bet values corresponding to the number of coins per payline. Fairy Magic has only 15 paylines. This is a bit on the lower side and reduces the flexibility in the betting options. The Bet Max button can be used to select 10 coins per payline and 15 paylines and also start the reels spinning. The Unicorn is the wild symbol. It does not multiply payouts but it can appear stacked on the reels in stacks of two or three. This results in more payouts and makes up for the lack of multiplier properties. It also offers the largest fixed jackpot of 10,000 coins. The Tree House is the scatter symbol. If three or more scatter symbols appear anywhere on the reels then scatter payouts ensue. Fairy Magic offers a bonus feature called Collective Bonus. This is triggered by the Fairy bonus symbol in a very interesting way. Whenever the Fairy appears on any reel she drops a star, which gets displayed below that reel. When four stars accumulate below any reel the Collective Bonus round is triggered. The four stars below the triggering reel are removed but the other stars remain. The Collective Bonus round offers 4 times the total bet as a bonus and five free spins with a 2 times multiplier. 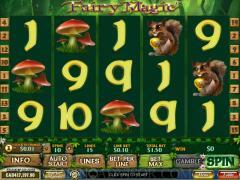 If the Fairy appears in this round additional five free spins are offered. 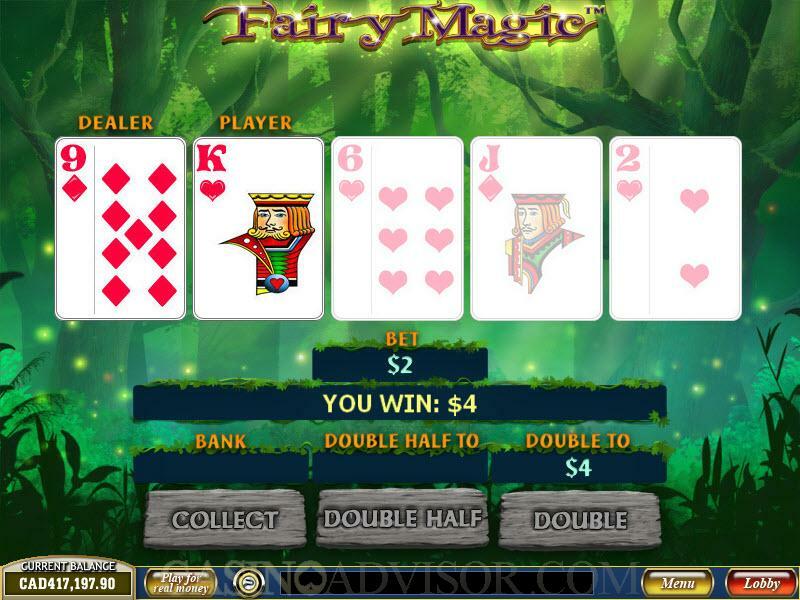 Fairy Magic offers an optional Gamble Game. The advantage of this game is that players have a choice of staking either half their current wins or all of their current wins. One card is dealt face up and four cards are dealt face down. The player chooses one of the face down cards and if it is higher than the face up card the staked amount is doubled. Interested in reading more detailed information about Fairy Magic? If so Click Here for more details.